Summer is around the corner, and you can’t wait to wear the trendy sandals you’ve dreamed about all spring. Do those nasty calluses and rough skin tell you that your feet are not ready to show off? The designers at Naturalico can give you a hand with their latest creation, an Electric Callus Remover and Shaver. This innovative device has a powerful motor that spins at 360° with a speed of 40 turns per second. It gently minimizes calluses and removes dead skin faster than other devices from the same category. Also, it is rechargeable, so you don’t have to plug it every time you use it. The Electric Callus Remover by Naturalico is perfect for both men and women. It can be used even by people who haven’t removed their calluses before. It comes with as many as two speeds, so you can customize the process. Furthermore, the exfoliation will be more efficient. It is provided with a grinding roller head fitted with abrasive microparticles that exfoliate the rough, dead skin from your feet and gently remove the calluses. Having smooth feet has never been easier! Since this Callus Remover is electrical, you might think that you need to plug it into an outlet every time you use it. However, this is not the case, because the product comes with a built-in 1200 mAh battery. The first time you use the device, you have to charge it for 8 hours. Following that, the charging time will be lower and the device will be capable of working independently for as many as forty minutes. A red light indicator will turn on while the appliance is charging and it will turn green when the battery is full. In terms of power, this model is one of the most capable ones in its category. The Callus Remover and Shaver is provided with a safety mechanism; if the user applies too much pressure, the roller will stop moving, in order to prevent injury. Another practical feature is that the device is easy to maintain. After every use, you can simply clean it with the brush you will receive in the package. Also, you can rinse the roller head with water. 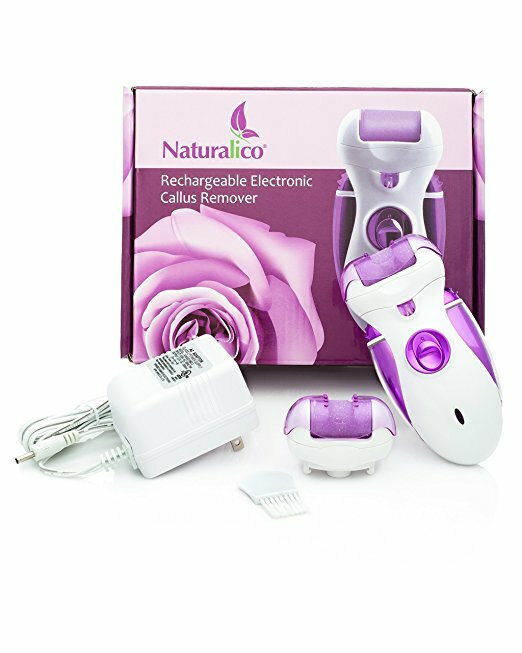 Due to the fact that Naturalico has designed this Callus Remover with rechargeable batteries, you don’t have to spend money on these items. Also, throughout the device’s lifetime, you can charge it more than 1,000 times. Your electricity bills won’t go through the roof, and you will protect the environment by not wasting so many of its resources. A flawless look from head to toe means a good first impression. Sometimes, it can be difficult to enjoy the benefits of a professional pedicure because you might not have time or money. This particular callus remover is able to turn your house into your own SPA because it helps you get professional results fast and without any pain. A good product comes with the right accessories, and this device from Naturalico is no exception. The package you’ll receive at your doorstep contains the Callus Remover, an extra roller head, a charging cable, as well as a small brush for cleaning. As you can see, the manufacturer helps you save some money; you will receive helpful accessories without paying extra. Happy customers say that this product has made wonders where other appliances have failed. Most buyers are quite pleased with the results; according to these people, the unit is particularly effective when it comes to fixing deep cracks. Most owners appreciate how they were able to finally get the smooth and silky skin they’ve always wanted on their feet, and that’s all thanks to this gadget.